set-to with an unpredictable external agency that looks an awful lot like fate. Three times the force attacks him and disrupts his scheme. The first time it comes at him with dishonesty and deception. Our man is able to get to his feet, he is still good to stand. Then it strikes him a low blow. He has trouble getting up from that, he is almost counted out. And finally it hits him with monstrous and extreme violence. Alfred Döblin (1878-1957) was born in German Stettin (now the Polish city of Szczecin) to Jewish parents. When he was ten his father, a master tailor, eloped with a seamstress, abandoning the family. Subsequently his mother relocated the rest of the family to Berlin. Döblin studied medicine at Friedrich Wilhelm University, specializing in neurology and psychiatry. While working at a psychiatric clinic in Berlin, he became romantically entangled with two women: Friede Kunke, with whom he had a son, Bodo, in 1911, and Erna Reiss, to whom he had become engaged before learning of Kunke's pregnancy. He married Erna the next year, and they remained together for the rest of his life. His novel The Three Leaps of Wang Lun was published in 1915 while Döblin was serving as a military doctor; it went on to win the Fontane Prize. In 1920 he published Wallenstein, a novel set during the Thirty Years' War, which was an oblique comment on the First World War. He became president of the Association of German Writers in 1924, and published his best-known novel, Berlin Alexanderplatz, in 1929, achieving modest mainstream fame while solidifying his position at the center of an intellectual group that included Bertolt Brecht, Robert Musil, and Joseph Roth, among others. He fled Germany with his family soon after Hitler's rise, moving first to Zurich, then to Paris, and, after the Nazi invasion of France, to Los Angeles, where he converted to Catholicism and briefly worked as a screenwriter for Metro-Goldwyn-Mayer. After the war he returned to Germany and worked as an editor with the aim of rehabilitating literature that had been banned under Hitler, but he found himself at odds with conservative postwar cultural trends. He suffered from Parkinson's disease in later years and died in Emmendingen in 1957. Erna committed suicide two months after his death and was interred along with him. Michael Hofmann is a German-born, British-educated poet and translator. Among his translations are works by Franz Kafka; Peter Stamm; his father, Gert Hofmann; Herta Müller; and fourteen books by Joseph Roth. A recipient of both the PEN Translation Prize and the Helen and Kurt Wolff Translator's Prize, Hofmann's Selected Poems were published in 2009 and Where Have You Been? : Selected Essays in 2014. 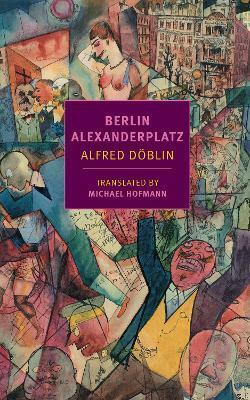 In addition to Berlin Alexanderplatz, New York Review Books publishes his selection from the work of Malcolm Lowry, The Voyage That Never Ends, and his translations of Jakob Wassermann's My Marriage and Gert Ledig's Stalin Front. He teaches in the English department at the University of Florida.